The American Staffordshire Terrier, also known as Amstaff (in the USA) or simply Stafford, is a medium-sized, short-coated American dog breed. It is one of the several breeds commonly known as pit bulls. In the early part of the twentieth century, the breed gained social stature and was accepted by the American Kennel Club in 1936. The name was changed to reflect a difference from the Staffordshire Bull Terrier of England. The American Staffordshire Terrier had a bad reputation for many years since it was originally created for dog fighting and bull baiting. Even though the fighting tendencies have been bred out, Staffords must still maintain the physique of a well-trained athlete. These dogs are extremely loyal, considerate and very fond of their owners. The Stafford is a wonderful companion and excellent guard dog, as it is always ready to defend its territory and family. Comparable Breed: Bull Terrier, Staffordshire Bull Terrier. The American Staffordshire Terrier possesses courage, determination and intelligence, and radiates power, agility and confidence. Stafford`s reliability around children is one of its most endearing qualities. The Stafford gets along with other dogs, however, the dog fighting breeds should never be taken to the house if there is already another dog, because they can behave quite aggressively. To be quite sure of this dog`s nature, you need to conduct the elaborate study. The Staffordshire Terrier is covered with very short, straight hair that needs minimum maintenance. It should be glossy, never soft or silky. The coat should be hard to the touch and tight to the body. This breed is an average shedder, therefore is easy to groom and only needs regular brushing with a firm bristle brush. Bathe your dog only when necessary. To make the coat shine, rub with a towel or clean cloth. 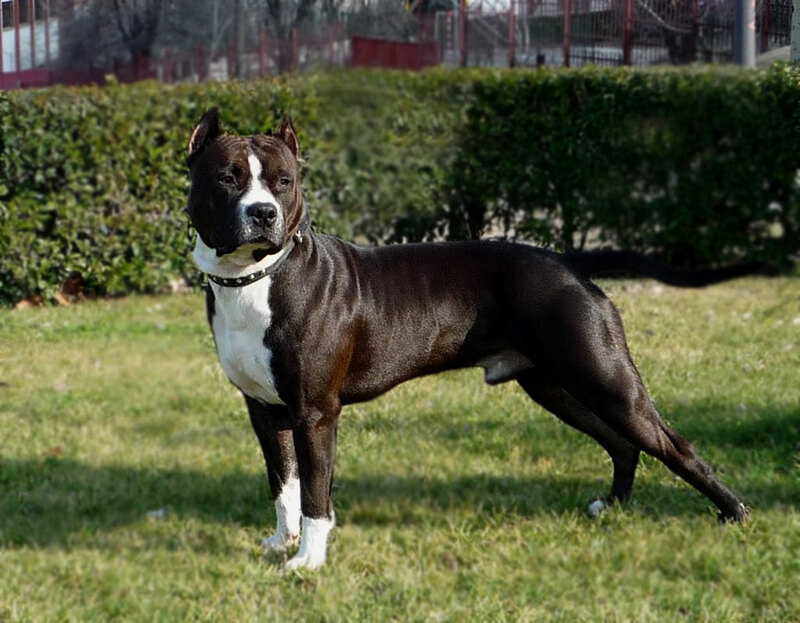 The American Staffordshire Terrier is a generally healthy breed. They are prone to thyroid problems, hip dysplasia, eye problems, and skin allergies. The American Staffordshire Terrier has a life expectancy of 9 to 15 years. The American Staffordshire Terrier is a very energetic, highly intelligent, self-willed and stubborn dog, therefore, its education and training are even more difficult and challenging. Sometimes, you might need a help from an experienced instructor who is familiar with this breed. The American Staffordshire Terrier requires socialization and obedience training from an early age. It is extremally important to set the rules, as Staffordshire Terriers tend to get dominant. Ultimately, this breed requires the experienced owner who is persistent and tough. The American Staffordshire Terrier has a very high potential of energy, which requires constant activity. Staffordshire’s should not be locked in the apartment. The ideal environment for these dogs is a small or medium-sized yard. Representatives of this extremely lively breed require at least two hours of physical exercise every day, otherwise, they can get bored and even destructive. Therefore, experts recommend long walks or run with the dog.